Eme has always been an independent spirit. She loved more than anything to have you pet her the exact number of times that she likes. As long as she has water, food and access to outside, she was satisfied. 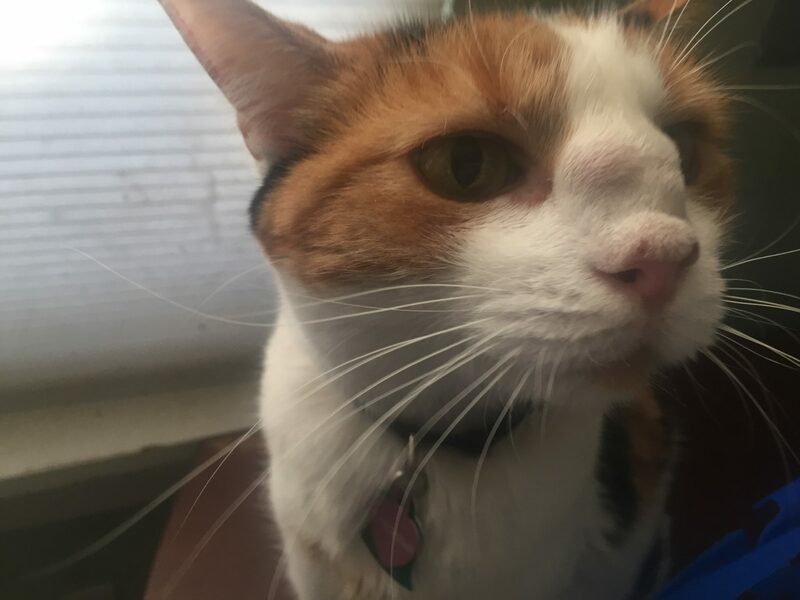 If you didn’t provide her with those things, she would dash across your feet as soon as you got up and meow at you until her levels of nourishment and entertainment were met. 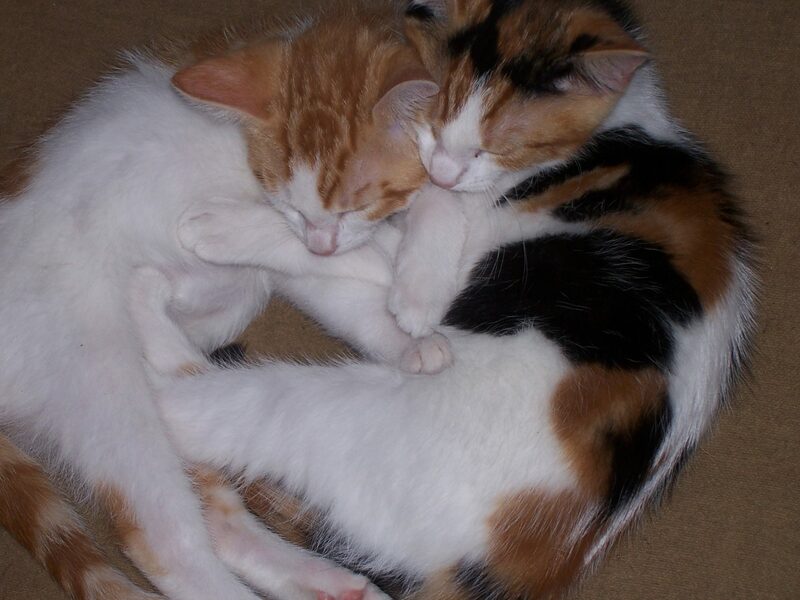 When we first adopted, Opie and Eme, they were inseparable. They curled up and napped together. They ate together. They hunted together. We were brought regular gifts of birds, squirrel tails and rabbits on the altar of our front porch. It was disgusting and sweet. I think our mail person thought we were in some strange cult. One day, about two years later, everything changed. I noticed that Eme’s nose was swollen and bloody after a night gallivanting around town. She hid when anyone came near her and I wasn’t able to catch her to go to the vet immediately. After a day, the bleeding stopped and the swelling subsided. I noticed an impression on the center of her nose but she had gone back to normal. 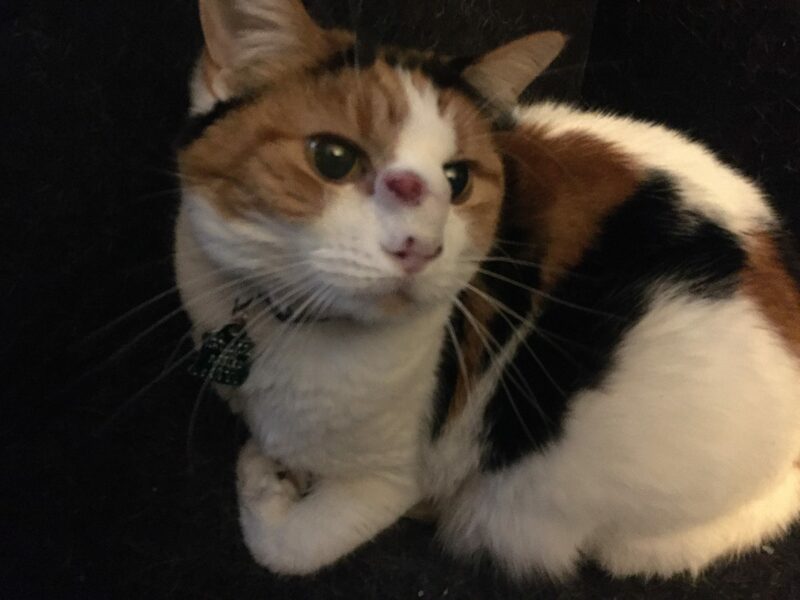 A few weeks later, I noticed the top of her nose swelling up again and she was sneezing like crazy. I took her to the vet immediately. The vet said it was fluid buildup. The injury to the nose was nothing that could be fixed. The vet said to watch it and bring her back if it seems to bother her. So, she has lived with a cycle of swelling and subsiding until last year. Last year, the swelling never went away. I probably wouldn’t have noticed because we were so used to her nose being swollen. But, this time the swelling was growing and her temperament changed. She became more of a loner. Eme was struggling to breathe and never left the house anymore. I could tell she was suffering. We took Eme to the vet. They did X-rays and determined that it was a solid mass. We tried antibiotics, steroids and about everything we could think of. Everything was pointing towards cancer. So, we had a biopsy done but surprisingly it wasn’t cancerous. But, from where the tumor was, if they removed it, there would be nothing left of her nose to breathe. So, February of this year, we had to put her to sleep. Nathan and I stayed with her and petted her and thanked her for all of the joy she brought our family.